As you embark into your 30's, you start to gain perspective on what is important and what to change. Tanning in my 20's was the highlight of my life. Now, not only am I freaked out about brown spots, wrinkles and cancer, I somehow lost the patience to lay and bake ALL day (unless I am on vacay) and would rather spend my money and time on retail therapy than tanning packages. With that being said, I do not enjoy being Casper white, therefore I do enjoy self-tanners. So leaving me little choice but to apply tanner at home I am always on the prowl for new products. I have a new FAVORITE product!!! 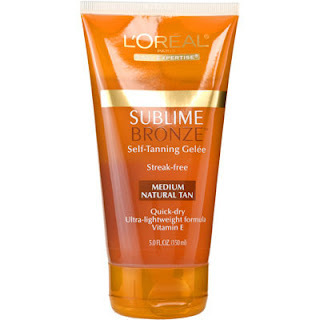 Loreal has done an awesome job creating this product. Lets just take the scent for starters. Usually, I put on a self tanner or get an airbrush in the evening (so I can sleep on it and awaken as a golden goddess) and somehow SMELL/TASTE the tan all night while I am sleeping. The Sublime Bronze is subtle and almost powdery. They call it Fresh Scent on the bottle. It is totally non-offensive to me and I can sleep like a baby while I become a shade darker. The application is totally streak free! I got the gelée and as you rub it in, it has a smooth velvety feel. I actually forgot to wash my hands last night after I put it on real late and woke up to tan hands-not orange!! WooHoo!!! I will be keeping the Sublime Bronze on hand to supplement my summer glow!